Place buffalo steak on a medium grill (spray grill with non-stick spray first) for 4-6 minutes per side, turning only once. Let steak rest for a few minutes before carving into thin strips. Use lettuce, tomato, and shredded cheese. 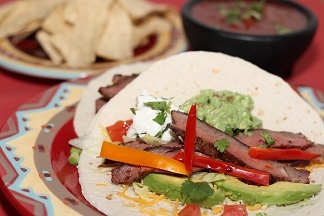 Slice limes into wedges and squeeze the juice on your tacos, top them off with pico de gallo and dig in! You can serve with chips, beans, and/or Spanish rice.